At a dinner one evening, my friend Dr. Rod Rosenbladt told me a true story of how he’d wrecked his car when he was sixteen years old. Rod had been drinking, and in fact, he and his friends were all drunk. After the accident, Rod called his dad, and the first thing his dad asked him was, “Are you all right?” Rod assured him that he was fine. Then he confessed to his father that he was drunk. Rod was naturally terrified about how his father might respond. Rod now says—and he has lived a lot of life, being in his seventies now—that he became a Christian in that moment. God’s grace became real to him in that moment of forgiveness and mercy. Rod has since spent over 30 years of his life as a spokesman for grace, teaching generations of students at Concordia University in Southern California, and as a co-host on both the White Horse Inn (a nationally syndicated radio show) and the Thinking Fellows podcast. The grace that Rod’s father showed him didn’t turn Rod into a drunk—it made him love both God and his father more. Isn’t that the nature of grace? We know that we deserve punishment and then when we receive mercy instead, we discover grace. Romans 5:8 reads, “While we were yet sinners, Christ died for us.” God gives us grace. He gives forgiveness and imputes righteousness to us while we are weak, ungodly, sinful; while we are His enemies (Romans 5:6, 8, 10). Our offenses are infinitely greater than a sixteen-year-old getting drunk and wrecking his car, yet God boasts about pouring out His one-way love on His undeserving children. True love is always at its most palpable and transformative when we are at our lowest ebb. Grace, like water, flows to the lowest part. No one had to tell Rod to be sorry for his foolishness. No one had to tell Rod to be thankful that his dad didn’t repay him “as his sins deserved.” That one act of grace and mercy transformed him—and his whole life was changed by it. Because that’s what grace does. It is the only thing that can transform entitled boys and girls into grateful men and women. 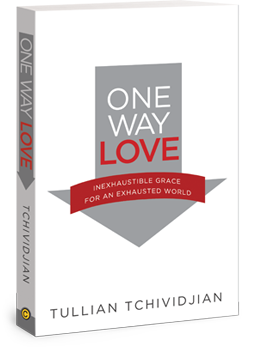 Revised from One Way Love: Inexhaustible Grace for an Exhausted World.